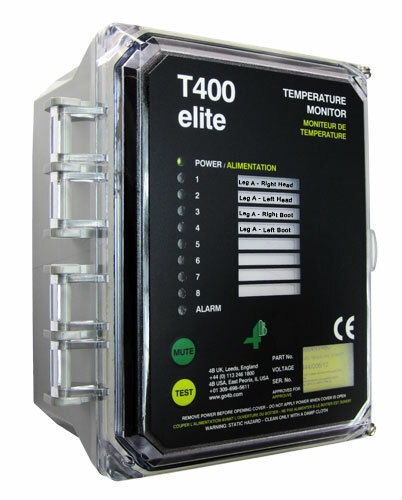 The T400N Elite Hotswitch is a microprocessor controlled temperature monitor, which works in conjunction with NTC type bearing & surface temperature sensors to monitor up to 8 inputs. The unit can provide an alarm and automatic shutdown, on up to 2 machines, when a high (hot) bearing or surface temperature condition is detected. Alarm and status LEDs on the lid of the T400N provide quick location of alarm conditions. Alarm muting can be performed at the panel or by an optional remote push button to silence external alarms. If the system is muted, it will automatically reactivate when a new alarm is triggered. Testing can also be activated at the panel, providing full system verification. The ADB series have been designed to allow the depth of the sensor to be adjustable. They screw directly into a bearing housing through the existing grease zerk thread. Each sensor is fitted with a grease zerk to allow lubrication of the bearing without the need for removal of the sensor. The ADB Sensor Tester has been designed to test 4B adjustable depth bearing (ADB) temperature sensors in the field. During planned maintenance or periodic testing, this diagnostic tool to verify the alarm and shutdown sequences of the control unit are functioning as expected. The WDB7 bolts directly onto a bearing housing, motor, gearbox, or machine casing for continuous temperature monitoring. Does 4B offer inspection, testing and commissioning services for your hazard monitoring systems? Yes, the 4B Tech Team is available for on site services. For more information, CLICK HERE. systems to suit your requirements and budget. integrated hazard monitoring system which can be operated as a stand-alone device or connected to your PLC. can offer you a scalable solution that can be expanded as your needs grow. To get a free recommendation from our engineers, CLICK HERE to fill out our online form.